At the request of a long time client, we created a stainless steel tri-fold boarding swim ladder. The aft ladder on the Niagara Yachts are not the most accessible, especially when fitted with an arch davit and dinghy. They traditionally are also too short and do not have enough steps go below the waterline for easy climbing. Using the genoa tracks, we used some salvaged SS Meriman track cars to land our mounting hinges. This also allows the owner to quickly switch from port to starboard depending on their needs…..and a few less holes to drill and bed in the deck! The new ladder is 3 hinged sections, 7 custom steps and 75″ long so there is lots of footing below the water. Electropolished finish will stand up the harshest ocean conditions for years to come. When folded up it is also in line with the stanchion lifeline height, so the boat’s aesthetics are not compromised. Not pictured are the hull standoffs welded on after photos and fitting. Pricing; Typically a Klacko Tri-fold ladder ranges from $950-1500.00 depending on the options and final custom design requirements. We’ve done our best to build a better foldaway ladder that will last a lifetime. Bi-Fold ladders range from 300-900.00 depending on options. We specialize in different or custom swim and dog ladder solutions, so feel free to contact us with any questions or requests. 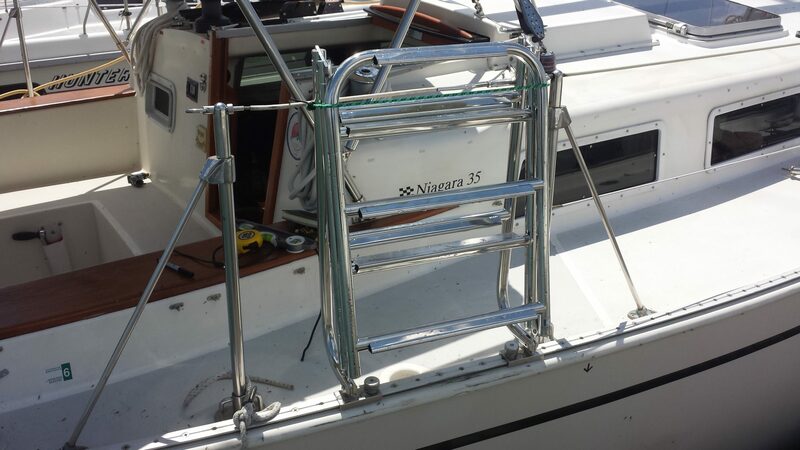 These ladder work very well on many classic boats with steep transom access problems. Niagara 35, Niagara 42, Whitby 42, Valiant and so forth. This entry was posted in hinterhoeller, Marine Hardware and tagged boarding, foldaway, ladder, niagara 35, niagara 42, sideboarding, stainless, swim, tri-fold, trifold, valiant, whitby 42, yacht. Bookmark the permalink.